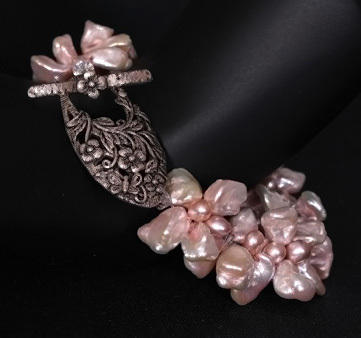 A Turkish silver toggle and natural colored South Sea pearls to adorn your wrist. Turkish silver, an alloy of 925 sterling silver that contains cadmium, giving the toggle a more shiny appearance and increased tarnish resistance. 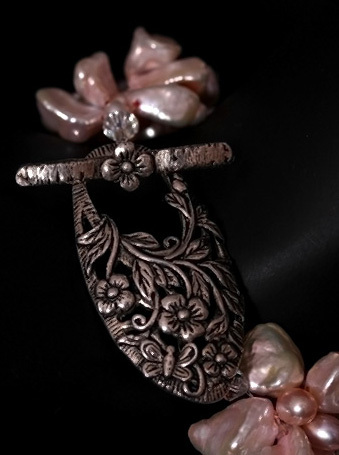 Designs in Turkish silver also more intricate, detailed and of higher quality then standard sterling silver. This toggle clasp, from Pegasus Imports, is meant to be shown off and worn on top of the wrist. Natural color, pale pink pearls and Swarovski crystals complete the design. Bracelet is made for a ~ 6 inch wrist. No adjustments will be made in size.